Jupiter is the largest and most massive planet in our solar system, containing more than twice the amount of material of the other bodies orbiting our sun combined. Most of the material left over after the formation of the sun went to Jupiter, forming a type of planet called a gas giant. Dark spots mark impact sites of comet fragments on Jupiter. A montage of New Horizons images of Jupiter and its volcanic moon Io. Jupiter's appearance is a tapestry of colorful cloud bands and spots. Most visible clouds are composed of ammonia and ammonia compounds, with unknown chemicals providing color. Jupiter's fast rotation - spinning once every 10 hours - creates strong jet streams, smearing its clouds into bands across the planet. With no solid surface to slow them down, Jupiter's spots can persist for many years. The Great Red Spot, a swirling oval of clouds twice as wide as Earth, has been observed on the giant planet for more than 300 years. More recently, three smaller ovals merged to form the Little Red Spot, about half the size of its larger cousin. Scientists do not yet know if these ovals and planet-circling bands are shallow or deeply rooted to the interior. The composition of Jupiter's atmosphere is similar to that of the sun -- mostly hydrogen and helium. Deep in the atmosphere, pressure and temperature increase, compressing the hydrogen gas into a liquid. This gives Jupiter the largest ocean in the solar system - an ocean made of hydrogen instead of water. Scientists think that, at depths perhaps halfway to the planet's center, the pressure becomes so great that electrons are squeezed off the hydrogen atoms, making the liquid electrically conducting. Jupiter's fast rotation is thought to drive electrical currents in this region, generating the planet's powerful magnetic field. It is still unclear if, deeper down, Jupiter has a central core of solid material. The Jovian magnetosphere is the region of space influenced by Jupiter's powerful magnetic field. It balloons 1 to 3 million kilometers (600,000 to 2 million miles) toward the sun and tapers into a windsock-shaped tail extending more than 1 billion kilometers (600 million miles) behind Jupiter, as far as Saturn's orbit. The magnetic field rotates with the planet and sweeps up particles that have an electric charge. Near the planet, the magnetic field traps a swarm of charged particles and accelerates them to very high energies, creating intense radiation that bombards the innermost moons and can damage spacecraft. 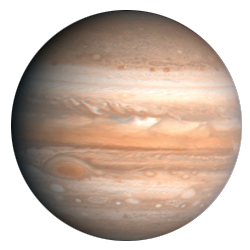 With four large moons and many smaller moons, Jupiter forms a kind of miniature solar system. Newly discovered moons of Jupiter are reported by astronomers and acknowledged with a temporary designation by the International Astronomical Union; once their orbits are confirmed, they are included in Jupiter's large moon count. Not including the "temporary" moons, Jupiter has 53 total. Jupiter's four largest moons - Io, Europa, Ganymede, and Callisto - were first observed by the astronomer Galileo Galilei in 1610 using an early version of the telescope. These four moons are known today as the Galilean satellites. Galileo would be astonished at what we have learned about these moons, largely from the NASA mission named for him: Io is the most volcanically active body in the solar system; Ganymede is the largest moon in the solar system and the only moon known to have its own magnetic field; and a liquid-water ocean with the ingredients for life may lie beneath the frozen crust of Europa, making it a tempting place to explore. Discovered in 1979 by NASA's Voyager 1 spacecraft, Jupiter's rings were a surprise, as they are composed of small, dark particles and are difficult (but not impossible) to see except when backlit by the sun. Data from the Galileo spacecraft indicate that Jupiter's ring system may be formed by dust kicked up as interplanetary meteoroids smash into the giant planet's small innermost moons. In December 1995, NASA's Galileo spacecraft dropped a probe into one of the dry, hot spots of Jupiter's atmosphere. The probe made the first direct measurements of the planet's composition and winds. Galileo studied Jupiter and its largest moons until 2003. Beginning in 2016, NASA's Juno spacecraft will conduct an in-depth investigation of the planet's atmosphere, deep structure, and magnetosphere for clues to its origin and evolution. The largest and most massive of the planets was named Zeus by the Greeks and Jupiter by the Romans; he was the most important deity in both pantheons. 2011: Juno launches to examine Jupiter's chemistry, atmosphere, interior structure, and magnetosphere.